Capt. Joe Shute was one of the first full time light tackle inshore guide for redfish and speckled trout in the Cape Lookout area. Capt. 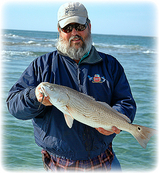 Joe started guiding for inshore light tackle fishing over 30 years ago. Over the years Capt. Joe has expanded his guide service to include near shore and offshore light tackle fishing for many different species of fish. In the last 23 years we expanded our guide service to include the ever-growing saltwater fly fishing community. Capt. Joe also opened Cape Lookout Fly Shop, a full-service saltwater fly shop to help serve the fly fishing community in the area. Over the years Capt. Joe has written numerous articles for both regional and national saltwater publications. Most of these articles have dealt with light tackle fishing in the Cape Lookout area. 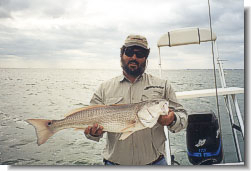 He has also written many "How-To" articles along with videos for inshore and offshore fishing. During January thru March, Capt. Joe participates in many different saltwater and fly fishing trade shows in Georgia, South Carolina, North Carolina, and New Jersey. He has participated in many "How-To" fishing seminars sponsored by such publications as "Sport Fishing Magazine" and "Saltwater Sportsman Magazine". Many anglers book fly fishing trips with us just to learn how to handle saltwater fly tackle. Capt. Joe will help beginners with the basics of fly fishing in saltwater. Whether you need help with your casting, rigging or selecting flies for your target species, Capt. Joe will be happy to help you any way that he can. Capt. Joe's boat is the original "Fish Finder." 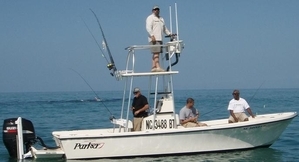 The Fish Finder is a 23 ft. Parker center console powered by a 200 hp. Suzuki 4-stroke. It is perfect for near shore light tackle fishing for false albacore, king mackerel, spanish mackerel, and amberjacks. When the wind picks up in the sound and marshes, the Parker's draft is shallow enough so that you can fish successfully for shallow water species such as speckled trout and red drum. Its 8 ft. beam and uncluttered open deck space allow two fly anglers to cast comfortably at once. The Fish Finder will cruise at 35 knots, plenty of speed to take you to where the current bite is on! Fish Finder is perfect for live bait fishing for king mackerel and other pelagic species due to having two 35 gallon live well tanks. As a full service charter guide, Capt Joe Shute provides all the bait, tackle, ice, rods and reels needed for your trip. Please bring what you would like to eat and drink along with proper weather attire, sunscreen, bug spray, cameras, etc. No Black Sole Shoes!! !